Google has added drag and drop to email – but only for those who use the Chrome or latest Mozilla Firefox browsers. Drag and drop to email has been on users' wishlists for some time now, and although the new feature will leave out Safari and IE users, its addition will be welcomed. 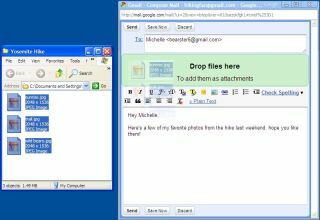 "Starting today, if I'm using Google Chrome or Mozilla Firefox 3.6, I can just drag and drop the files to attach them — easy as pie," said Gmail software engineer Adam de Boor on the Gmail blog. Other browsers will get the functionality, adds de Boor, but it will take some changes on their end. "We'll enable this for other browsers as soon as they support this feature. For now, you can drag and drop attachments in Chrome and Firefox only," he adds. Interestingly, the feature has gone straight into Gmail functionality rather than as a Labs add-on, and is up and running and working perfectly well right now.